What life is it, if all you do is play it safe? I suffer from the same crippling self-doubt most writers do. I can, also, find myself falling into a complaining vortex. I have toyed with the idea of affirmations, of getting up early and looking at myself in the mirror, and saying, “Erich, you are a writer with a story to share that people will want to read!” And, I’ll rewire my brain and quickly ascend the world of the literati. Anyway…I could never do it consistently. 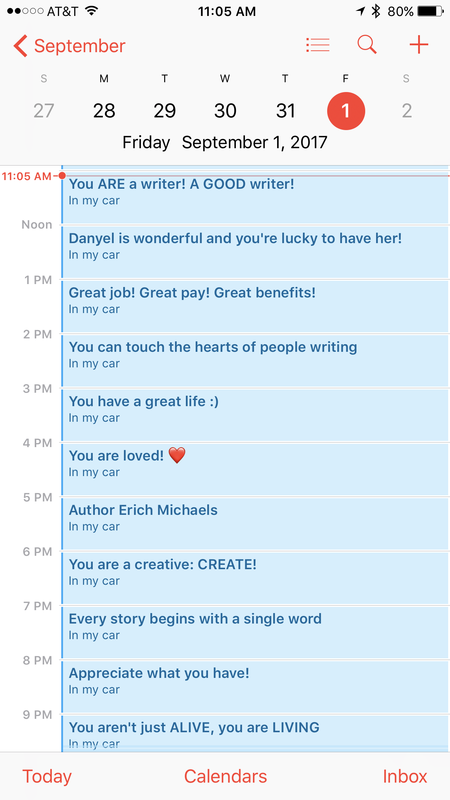 Soooo, I used the calendar app on my iPhone and created events throughout my day–reminders of how good life really is and how I am meant to write. I read the event when it pops up, I whisper it aloud to myself and I smile.